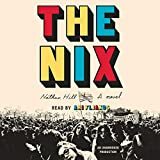 Nathan Hill's sprawling novel The Nix (the unabridged audiobook is 22 hours long) is a satire of modern times but goes back to the 1960s too. The central characters are Samuel Andresen-Anderson and his mother. Samuel is a bored professor of literature at a small suburban university outside of Chicago. He once wrote a novel but his second novel is stalled. He spends most of his spare time playing a massive multiplayer online role-playing game featuring many elves in his university office because the connection is faster than the one at home. Teaching students who don't want to learn has worn him down, and he no longer cares. Nevertheless, he is annoyed when one student is so blatant in her dismissal of everything he has ever worked for and her completely mercenary approach to her studies, and he does not manage his anger well. So, of course, he gets caught up in university politics. His despair about his life increase and his addiction to the online game keeps its grip on him. At the same time, his mother has attacked a ridiculous and outrageous vote-winning presidential candidate (Hill swears he came up with the character before the rise of Donald Trump). The attack was caught on video and has gone viral. She will be prosecuted and has come under public scrutiny. This turns up her past as a political activist in the 1960s, which comes as a surprise to Samuel. His publisher pressures him to write about his mother to make up for the second novel he never wrote, so although they had been estranged, he reconnects with her and finds out about her days as a anti-establishment student in the days of protest politics and free love. There are many other characters who might have been eliminated by a strict editor. The story goes on and on, with slow detours into different parts of modern life which apparently delight some readers and frustrate others enough to give up with the book altogether. It helps to listen to the audiobook performed by Ari Fliakos, who provides energy to the story when the listener has nothing left to give. The fundamental problem with the story is that it is a collection of overblown but lively vignettes, and neither Samuel nor his mother are characters we have any particular reason to care about. The Nix would have done better as a collection of short stories. By the time we get to the resolution of the story, it makes no difference. But we can marvel at Hill's audacity in presenting such a sprawling work as his first novel, and getting away with it.